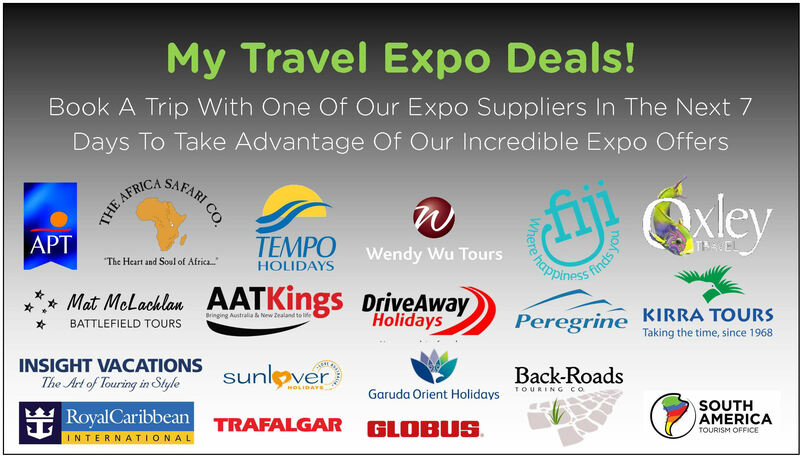 ← My Travel Expo, 1 October – 1 Night Only, Its Here! Well, what a night! Our thanks to our industry partners and our visitors for making it such a fantastic night! Having said that we do have a number of fantastic offers from our industry partners, from Cruising around Fiji with Captain Cook, discovering Tasmania with AAT Kings, Safari on the Serengeti with the Africa Safari Co, relax on a beach in Hawaii with Qantas Holidays of discover the mysteries of Peru with the South American Tourism Office. For a full look at all Expo specials please click here! Be warned the file is large and may take some time to load. Please note all specials are of limited duration so if one takes your fancy now is the time to act! Posted on October 2, 2015, in Events, Promotions, Specials, Updates and tagged Deals, my travel expert, My Travel Expo, Shoalhaven Solo Sisters, Single Travel, Single Traveller, Solo Travel, solo traveller, specials, Travel. Bookmark the permalink. Leave a comment.